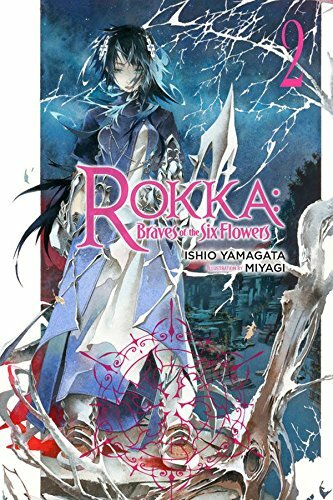 This review is for the second volume of Rokka: Braves of the Six Flowers by Ishio Yamagata (with artwork by Miyagi). The English edition was released by Yen Press in August 2017. The third volume will release on December 19th. At the moment there are six volumes for this series in Japan (plus a bonus “Archives” volume). Volume 1 of Rokka ended with a couple big plot twists, but I’ll keep this review as spoiler-free as I can. Suffice to say though that volume 2 builds upon the reveals of the first book, and plays with reader expectations of what events should follow. Rather than giving us a rehash of the original mystery, this next chapter of the Braves’ adventure offers all new twists and turns and presents them in an engaging new way. The Braves of the Six Flowers continue their journey into the land of the fiends to fight the Evil God and his commanders, but their biggest dilemmas still require them to use their heads and work out everyone’s plots, schemes, and tricks. There are two new characters we learn about in this volume, and they’re both great additions to the story at large. Rolonia is the Saint of Spilled Blood, whose magic entails the control of blood (primarily for healing purposes, but is also employed in conjunction with a whip when fighting). She showed up at the very end of volume 1, and has ties to both Adlet and Mora. Like Adlet, she is underestimated by everyone–but this is due to her timid and fretful personality rather than her level of ability. I found her a likeable character and an interesting addition to the main cast, if only for how she contrasts with most of them. The other new character is a fiend commander named Tgurneu. He was brought up in flashbacks in the first volume, showing how he was tied to Adlet and Fremy–but in this story he is the central villain and we get to see his machinations against the Braves in full swing. And I have to say, the three-winged lizardman really steals the show in this one. He’s portrayed as the scheming type with elaborate plans–and indeed, each time it looks like the heroes have worked out some aspect of his plot, it turns out there’s another layer to uncover. But at the same time, Tgurneu goes about everything in such a nonchalant manner, and is willing to fight the heroes head-on seemingly on a complete whim. Every action he takes is intended to mess with our protagonists. Just delightful. We also learn a lot of Mora’s backstory in this volume, which is great because she was one of the more mysterious characters of the first novel. She’s definitely a unique character for light novels. An actual adult–and more than that, a mother and a wife, and a mentor whom many people look up to. Her role in this story is full of twists and turns, and in this volume the story actually starts out with a big reveal regarding her right off the bat. The author, Ishio Yamagata, clearly wanted to hook all the readers in who were left feeling iffy about the series following the first volume’s twist ending. All in all, I’m pleased to say volume 2 of Rokka doesn’t pull any punches. Anyone who enjoys a good fantasy adventure with mystery elements should definitely check this series out. I’ve got the first volume of this on my current wish list. I may need to check it out. Thanks for the review. It’s an interesting series so far. Hope you enjoy it!